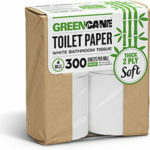 Greencane paper is a new product available in the UK that will be of interest to all green householders. It is made from sugarcane and bamboo making it an environmentally friendly option and is also packaged in paper and cellophane making it compostable too, ticking the box if you’re trying to go zero waste. Here at GreenFinder HQ we’ve been trialling the mixed box which contains 32 rolls of toilet paper, 6 rolls of paper towels and 3 boxes of tissues. We found the products compared favourably with both recycled and non recycled brands on the market and particularly found the kitchen towels to be really absorbent. All the products were soft in texture and were of great quality and in terms of value a good buy. The household pack which includes home delivery retails at £23.80 and as a busy family it suits us down to the ground as we prefer to buy in bulk to save on time, energy and packaging. All the Mixed Box products are environmentally sustainable as Greencane paper is made from plantation-grown bamboo and recycled sugarcane waste, which has already saved over 3000 trees. It is BPA free and has no GMO. The brand is the brainchild of Geoff Arden who in 2009 came across a local forest being felled for pulp which coincided with his discovery of bagasse – a tropical product made from recycled sugarcane and bamboo, and which can be used to replace up to 70% of the timber typically found in paper products. “We grow trees for 20 to 30 years that end up as pulp which is the lifeblood of the toilet paper industry,” said Geoff. 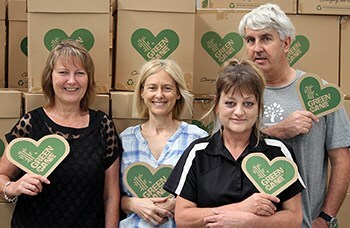 “It’s just wrong when you have a sustainable alternative that only takes one year to grow.” Geoff runs his ethical enterprise with his wife Helen a former dentist who is at the heart of every environmental decision made about the direction of Greencane. 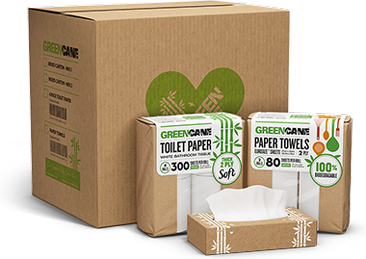 For more information about the Greencane range and their household box you can visit their website here. The brand also provides sustainable toilet paper, napkins and paper towels to businesses and workplaces.